Dressing great and spreading holiday cheer are commensurate! How to attire for jubilant December. A zip cardigan or vest: either one is a modern interpretation of a classic theme, the sweater/vest. A zip front and mock neckline give the pieces a more ‘current’ look. They’ll both look new and not stodgy. Steve McQueen & 007's penchant for turtlenecks instantly make this garment clutch. A turtleneck sweater; It’s back and it’s way cool. Think cashmere or extra fine wool. Match it up with a pair of jeans and you are looking sharp. Forget winter white flannels (unless Ralph Lauren is your host). 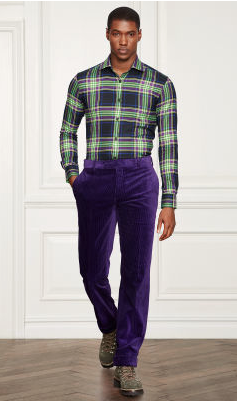 Try a brushed cotton or luxury corduroy and have some fun with colors. Try the new red, the new blue, or the new “Rhone Olive”. Don’t get crazy, I’m not talking about Versace 80’s print. I’m talking about a simple print. If size and scale are a concern, keep the pattern small and make the background of the shirt dark. One simple rule: dress so that the most well dressed guest at your party doesn’t feel that they are overdressed. It’s a nice show of appreciation to the efforts of that guest. And you’ll feel good as well.